bl.uk > Online Gallery Home	> Online exhibitions	> Asia, Pacific and Africa Collections	> Dagshai 1883-84. 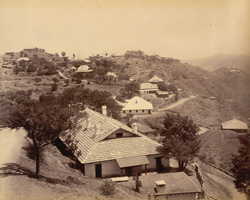 Photograph of Dagshai, from the Macnabb Collection (Col James Henry Erskine Reid): Album of Miscellaneous views, taken c.1883-84. This is a general view of bungalows scattered over hills in the cantonment at Dagshai. Dagshai was a military station in the Shimla District, situated in an elevated position overlooking the cart road from Kalka to Shimla. At the time this view was taken it was the headquarters of a British infantry regiment and during the summer months a detachment of British infantry from the Ambala garrison were also quartered here.